It's time to intervene! Whether the person's a shopaholic, obsessive compulsive, hoarder, serial-dater, chocoholic, or bad dancer. It's up to you to let your friends know when they have a problem. 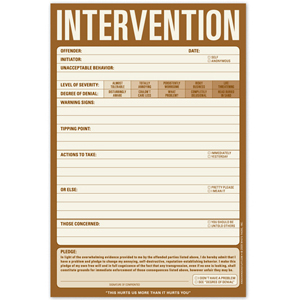 Sit them down somewhere quiet and let them have an Intervention sheet. When they start screaming and shaking cue the swat team to chain them up and drag them to the isolation chamber in the desert. Everything should be a piece of cake from here on out. 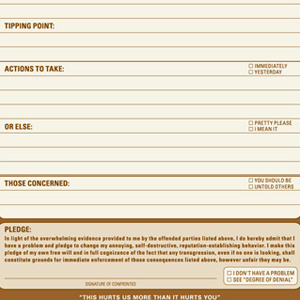 Feature: - Perfect for good friends, care-takers, smotherers, and control freaks! Feature: - 6 x 9 inches; 60 sheets.